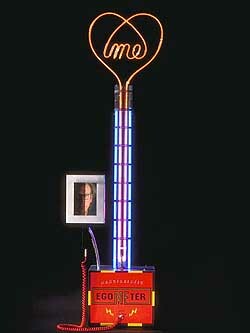 This egoMETER is a device for measuring a test subjects ratio of self-indulgence to communitarian altruism. Clinical trials were conducted by the Significant Ego Litmus Foundation (S.E.L.F.) of Geneva, Switzerland over a two-year period to establish the raw technology used in creating this proto-type device. The egoMETER was developed with a generous foundation grant from S.E.L.F. to Tesla Neon (Chico) and AXO Design (San Francisco) in an effort to establish an international technical protocol for ego assessment. The S.E.L.F. foundation works tirelessly to develop worldwide awareness of rampant self grandiosement of modern society leading humanity down a course of cultural and environmental destruction. The egoMETER is critical as a diagnostic tool to identify a test subjects latent tendency toward narcissistic ego development and give a sound diagnosis so they can seek immediate treatment from a qualified ego conselor. Inflated ego is a treatable disease, if it is diagnosed early. Tesla Neon encourages everyone to have their ego tested so they can get on a path of balanced ego development. Save human culture and the environment, get tested today. 13 May 2003 @ 16:09 by catana : The Onion? Certainly worthy of the Onion. Gee i wonder if they would find statistical differences between the sexes when measuring the EGO? And what about those EGO's that might break the meter when ME gets over pressured? The Kolorbars slide show is wonderful. Thank you.